Schlage Andover doorknobs are a popular shape with an outset detail on the end of the knob. 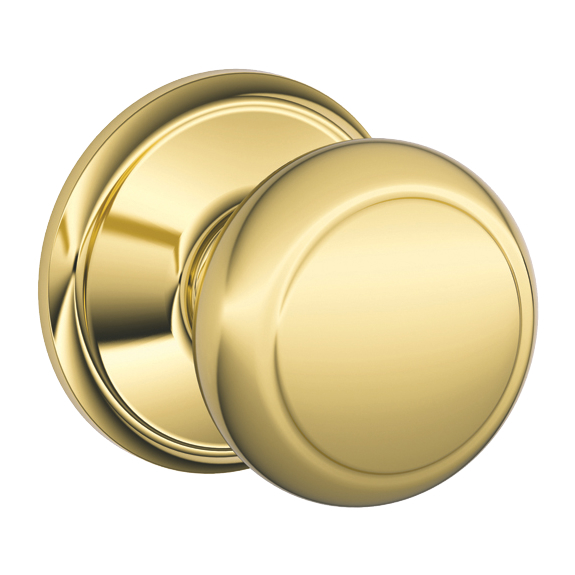 The Schlage Andover doorknob is available in 4 finishes and 4 functions. 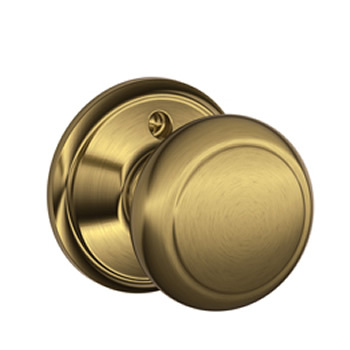 If you are replacing your current door knobs or finishing up a new construction project, Schlage doorknobs are a great solution. 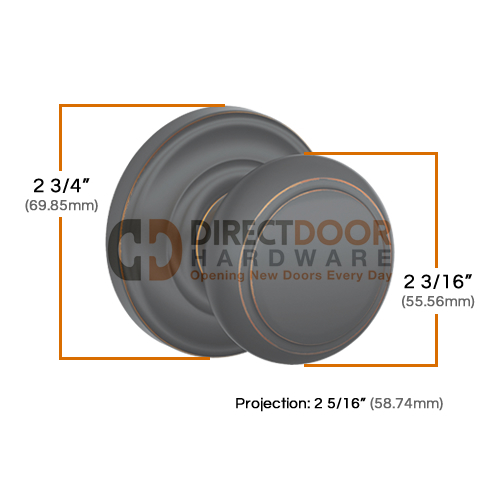 Schlage packages their door knobs with a 5 way adjustable latch that with removable faceplate to accommodate doors prepped for drive in latches or latches with faceplates. 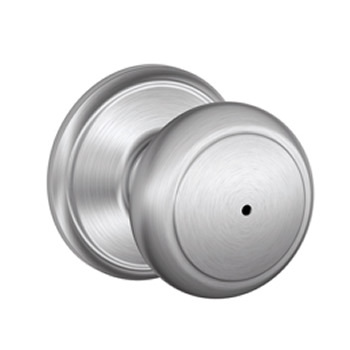 Schlage's versatile design is easy to install and works for most applications. My new knob installed easily,looks good,and makes my wife a very happy lady...glad you carry a 5 inch option which as you know is not easy to find. 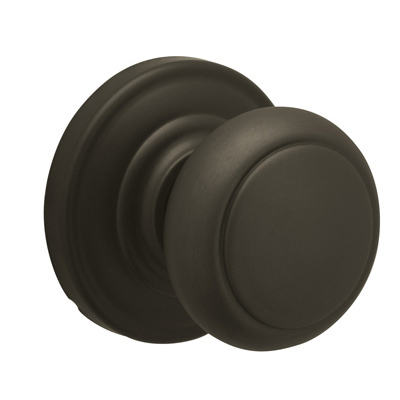 I purchased an oil rubbed bronze doorknob for our master bathroom as we were having it renovated with ORB plumbing fixtures. The doorknob looks great on the door. Good quality and easy to install. This is a very good product. Very easy to install. I also puchased a 5" backset latch to fit my door. 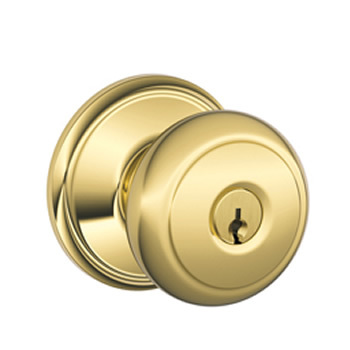 The two products, both Schlage, worked together seamlessly. No issues whatsoever. 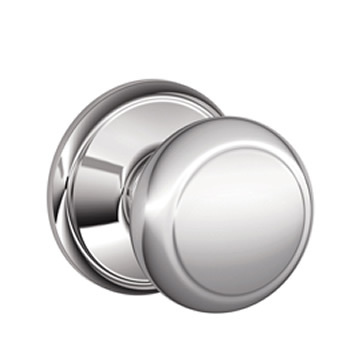 This knob isn't bad. Reasonable construction, easy to install, works well, and ok finish (on a 1 to 10 scale I give a 7.5). 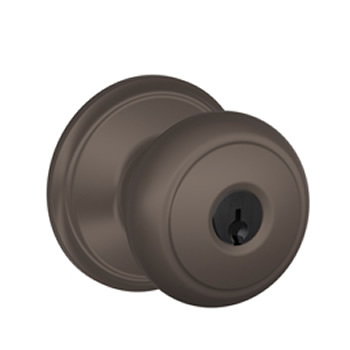 But, Schlage has come out with a new version with concealed screws on both sides, square vs radius-ed corners on the faceplate, and a slightly diff model number FA10-AND vs F10-AND. Is one better then the other? I don't actually know but be aware if you're matching. 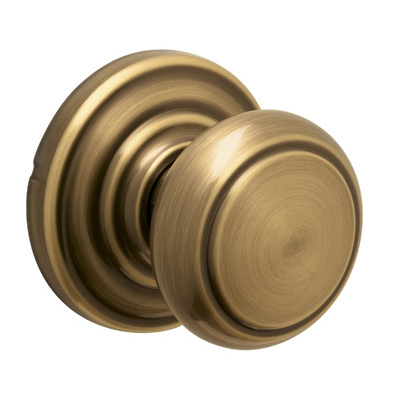 [My bad, I missed the detail] My 5 star rating is reserved for solid brass constructed knobs. Hard to find elsewhere in polished chrome. Quick delivery. 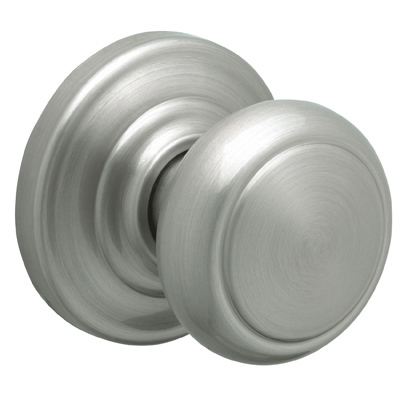 Bought with matching deadbolt to go with old refinished polished nickel door hardware and chrome kitchen faucet. 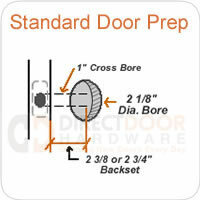 Installed easily in new Pella door, looks fabulous and works very well. Very happy! Great quality, easy install. Looks, feels and operates amazingly. Highly recommended. Excellent choice, looks very nice in the Aged Bronze finish. 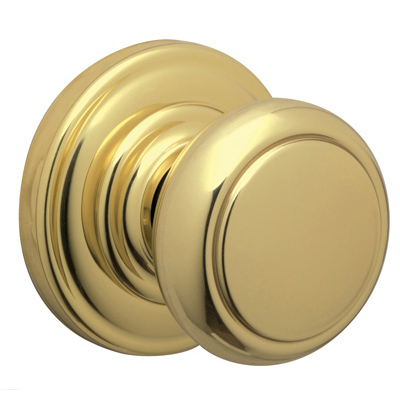 Are the Andover, Georgian and Plymouth door knobs all to ANSI 2 standard? We need the squared corner faceplates and latch plates. 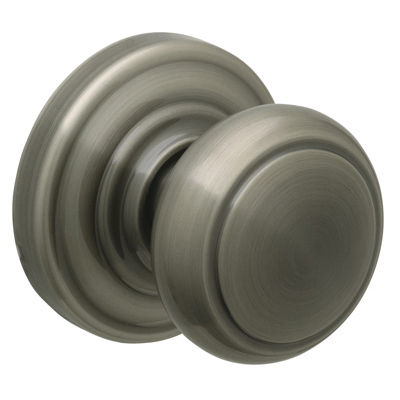 It says these come with rounded corner strike and mortise plates but square are available upon request. Are these the same thing? Would this be a special order and need to be done over the phone? 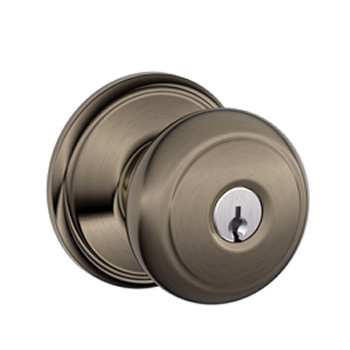 What's the procedure for getting a new deadbolt keyed to the lock currently in our house? 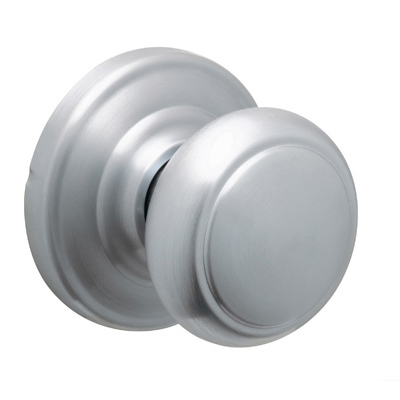 Is this a "dummy" door knob? 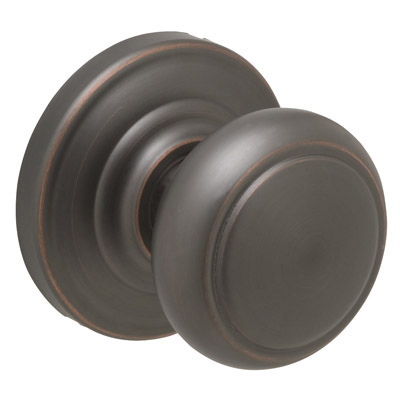 I've purchased mult Andover knobs in dark rubbed bronze finish-all the bathroom knobs wear and tarnish within 6 months of install-revealing the base brassy look. I'm guessing the damp hands, lotioned hands wear the finish? 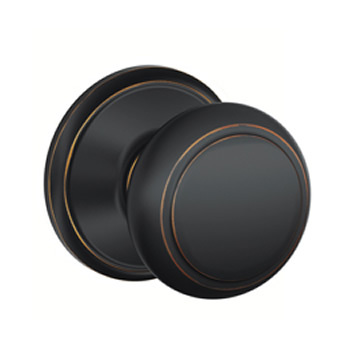 I'd like to change the knobs to an antique nickel finish...will the finish wear on these as well...to reveal a brassy base?